This is the frank autobiography of Marguerite Porter, who was a prima ballerina with the Royal Ballet Company. Beginning with her introduction to ballet by two friends who taught her ‘a few exercises in their tiny back bedroom’, Ms Porter tells with honesty and charm the story of her rise from a poverty-stricken childhood in Doncaster to the supreme heights of the ballet world. 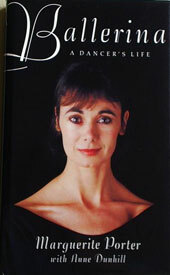 In fascinating detail she describes her developing career as a dancer: training at the Royal Ballet Upper School; her early years as a member of the corps de ballet when as a ‘star-struck seventeen-year-old’ she was overwhelmed by touring with such idols as Margot Fonteyn; her promotion to prima ballerina. If you are a ballet fan then this should be right up your street. Full of gossipy tales plus an excellent insight in to the demanding, all consuming world of the ballerina.